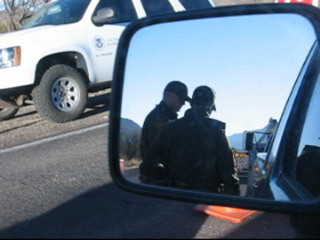 Most recently on December 20, 2008 while driving home from work yet again, a tribal officer operating just off the reservation colluded with U.S. Border Patrol agents to cite me with impeding traffic – a state violation. 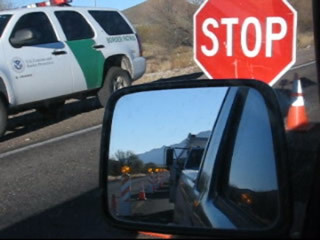 The alleged impeding took place while I was stopped in front of two temporary stop signs erected by U.S. Border Patrol agents who were seizing and detaining individuals at an internal suspicionless Homeland Security checkpoint. Yes, you read that correctly. A tribal officer, operating off the reservation, cited me with a violation of state law for impeding traffic because I was being stopped and seized by armed federal agents in front of two stop signs at a Homeland Security roadblock setup along a state highway. 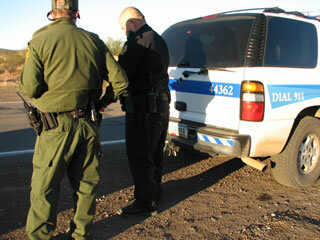 The DHS roadblock in question is the same one I’ve been documenting since early January of 2008. 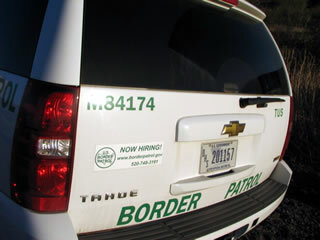 Border Patrol agents routinely use so-called ‘immigration’ roadblocks as a pretext to look for felons, weapons, terrorists, narcotics, aliens and other illegal activity (except their own of course). Over the past year, I’ve been stopped and seized well over sixty times at this particular dragnet operation but have always been waved through…eventually. 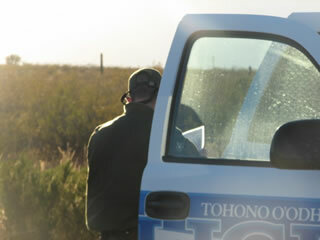 On December 20th, the seizure took a slightly different twist however after Border Patrol agents conspired with a tribal officer who just happened to show up in the checkpoint’s staging area during the three minute interval I was seized and detained by federal agents in front of a stop sign. During our initial interaction, the nameless Homeland Security agent admitted he knew who I was and to watching my videos online. 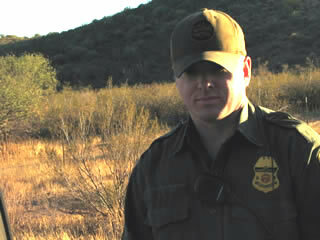 Despite acknowledging this and being fully aware of the fact that dozens of DHS agents and supervisors have waved me through the checkpoint in over sixty stops during the past year, he continued detaining me for the purpose of giving the tribal cop enough time to get into position to cite me for impeding traffic. 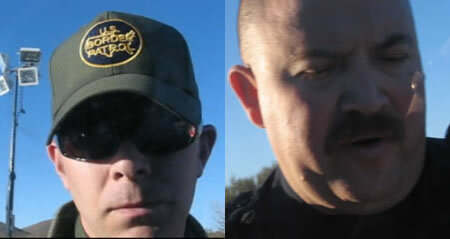 In doing so, the armed federal agent was in fact impeding the very traffic I was later cited for. After more demands from the nameless supervisor and more questions from me, he and his fellow agents spent several additional minutes holding up traffic while acting as if they were inspecting my vehicle. Unbeknownst to me, while this was going on a tribal police SUV was being directed into the checkpoint staging area behind and to the South of my vehicle. 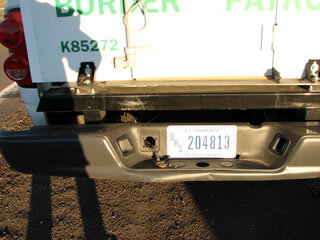 The field supervisor continued pretending to inspect the opposite side of my vehicle where my attention was focused. The second image above and the one below confirm that the police SUV was not in the lane of traffic behind me during the time I entered the roadblock and was being seized. After the tribal officer was in position, the agent walked over to the stop sign and told me to have a nice day. He offered no explanation and made no explicit indication that I was free to go. Since DHS agents in previous seizures have told me it’s a felony to just drive away from a checkpoint without permission, I’m always hesitant to leave without explicit instructions that I’m free to go. This is especially true given that agents have been known to use arbitrary hand signals and give conflicting orders to create the illusion of reasonable suspicion or probable cause to take further action they can’t justify otherwise. While waiting for the agent to tell me I was free to go, I demanded his name several more times. Instead of identifying himself, he continued to tell me to have a nice day while claiming I was obstructing him. This went on for a few iterations (less than 30 seconds) until the agent finally told me to leave the checkpoint. I began driving away within seven seconds only to look into the rear view mirror to see a large SUV right on my tail followed shortly by enforcement lights signaling me to pull over. I pulled over thinking it was another Homeland Security agent seeking to continue the harassment outside the boundaries of the checkpoint. After I came to a stop, a man in a black uniform approached my vehicle with his arm up attempting to block his face, name tag and insignia from my camera while demanding my ID. I asked him to identify himself along with his reason for pulling me over. 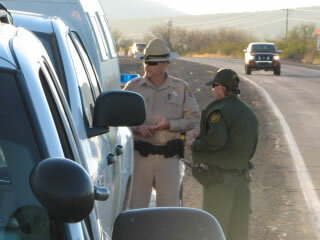 He refused and instead went back to his vehicle where he confered with several Border Patrol agents who pulled in behind him. After several minutes, he came back and identified himself as Officer R. Carrasco, badge #166, with the Tohono O’odham Police Dept. He still refused to explain why he pulled me over however while continuing to demand my identification. After further consultation with Border Patrol agents from the checkpoint, Officer Carrasco finally told me he pulled me over for impeding traffic. Upon further demand, I provided Carrasco with my license, registration & insurance card which he promptly shared with the Border Patrol agents after going back to confer with them yet again for another lengthy period of time. With all the enforcement vehicles and personnel from three different jurisdictions present at the traffic stop, anyone driving by would most likely have thought a large bust had just gone down. I’m sure they would have been surprised to discover instead that a tribal officer had become a patsy for U.S. Border Patrol agents bound and determined to violate the rights of the traveling public. In all, the illegal traffic stop lasted well over an hour and involved upwards of four Homeland Security agents, one TOPD officer and one State Trooper from the Department of Public Safety. Given the large show of force, one would think it’s a traumatic experience for enforcers to encounter individuals willing to peacefully assert their rights as opposed to role over like obedient lap dogs to every arbitrary demand directed at them. As expected, the statute I was cited with violating had nothing to do with the actual scenario. It was written to address the problem of individuals driving too slow along public highways. I on the other hand was only stopped because I was directed to by a traffic control device and armed federal agents seizing individuals at a Homeland Security roadblock along a public highway. When the federal agent who initially seized me at the roadblock ordered me to leave less than three minutes after I arrived, I promptly left. As such, the only individuals impeding traffic were the federal agents who needlessly detained me after admitting they knew who I was. In hindsight, it’s obvious the supervisor detained me for nearly three minutes for the sole purpose of setting me up for the tribal officer. The tribal officer on the other hand was more than willing to do the Border Patrol’s dirty work by involving himself in a federal checkpoint operation in which he is neither certified or trained to be a participant in. In so doing, he not only set himself up to take responsibility for his own actions, but those of the Border Patrol as well. A. In a charge of violating a speed restriction in this article, the complaint and the summons or notice to appear shall specify the speed at which the defendant is alleged to have driven and the maximum speed applicable within the district or at the location. Officer Carrasco conveniently failed to specify the speed I was driving at along with the maximum speed appropriate for the location as required above. This is because the appropriate speed for the circumstances was zero. Carrasco probably missed this nuance in the statute because he was more interested in pleasing federal Border Patrol agents and/or harassing me then in determining whether or not I had actually violated a state statute. After a closer inspecting of the traffic ticket, I note that Officer Carrasco did indeed indicate my speed was 0. In order to justify the citation however, he claimed the posted speed limit was 15. As I indicated earlier however, I was stopped in front of a stop sign while being seized by several armed federal agents which means the appropriate speed limit for the time & place was 0. “I certify that upon reasonable grounds, I believe the person named above committed the acts described and I have served a copy of the complaint upon the defendant.”. Given that the checkpoint is allegedly a federal operation and the alleged traffic impeding took place while being seized by the Border Patrol in front of a stop sign in the middle of the highway, I’m quite interested in seeing how the tribal officer justifies his involvement in this federal operation that wasn’t even on the reservation, let alone prove I was impeding traffic while being detained by federal agents. Luckily for me, Officer Carrasco and the participating federal agents have provided me with a good forum for discovering answers to the many questions I now have regarding this roadblock and subsequent traffic stop. 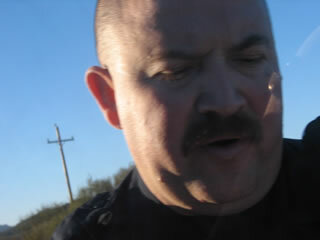 I’m currently scheduled to appear in Tucson Justice Court on January 16, 2009. I will however be seeking a continuance and discovery prior to proceedings which will most likely result in a court date rescheduling. Further updates will be posted as they become available. In the meantime, welcome to the new American police state.